Stunning Eire Design Leopard print dress for sale. Made Sept 2011, unfortunately for sale due to growth spurt over Christmas. Dress is currently being worn by slim Under 16 WMH. 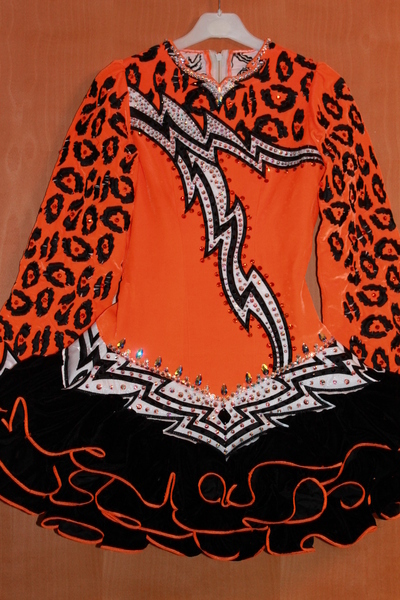 The Bodice is a very vibrant Orange Velour with leopard print embroidery on top of bodice and sleeves. Skirt is black velour ruffles trimmed in orange. Dress is covered in 100’s of genuine Swarovski Crystals in Jet, AB, Fireopal and AB Pear Drops in a variety of different sizes. Dress has fabulous stage presence. 2″ Let down and let out in bodice. Asking Price: £800 Ono. Shipping costs are not included in the asking price. Sale is final.